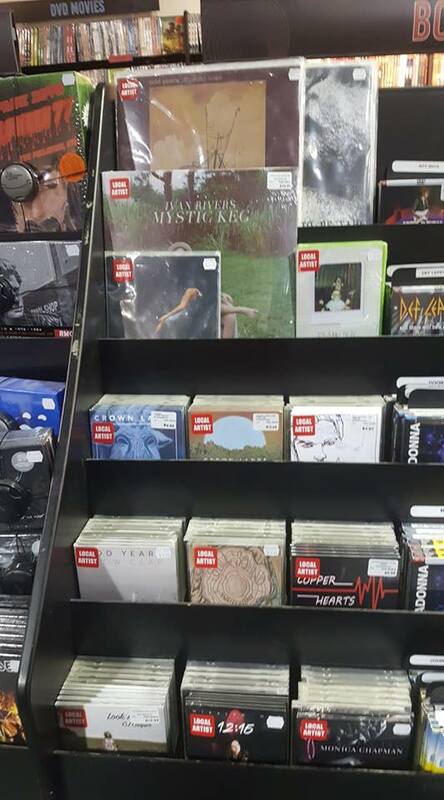 Local Musicians Section at Sunrise Records! *Correction: Management at Sunrise Records prefers that you contact Sarah at stoneroad@sunriserecords.com concerning getting your music on their shelves. The manager of the Guelph location is Sarah at stoneroad@sunriserecords.com! Sunrise Records in the Stone Road Mall has a section of music dedicated to local artists! Bry was perusing the mall during the Black Friday sale to see what all the fuss was about, and he happened upon a wild Nick Clark of Pressed by Nick and creator of Punk Rock Flea Market Guelph. He was excited to show Bry about the local music section, at which incredulousness Bry scoffed with a pugnacious “Ha!” fit for a Tzar or Phyllis Dyller. “Seriously,” Nick contended and gesticulated with his outstretched paw, and trundled sweatily along the central gangway. “Look, Odd Years, Copper Hearts, Frank Dux, Still Sound, Monica Chapman. A bunch of ’em,” he labored. And so it was. Check out the local artist section! And get in touch with super star Nick Clark about getting your album on the shelf, if you feel your band is worthy. Bry knows there’s been a lot of amazing music coming out of Guelph and area that he would love to see displayed on the rack.